The BCFL all-star team poses on Saturday before their game against the BGFL. The BCFL team won, 26-8. 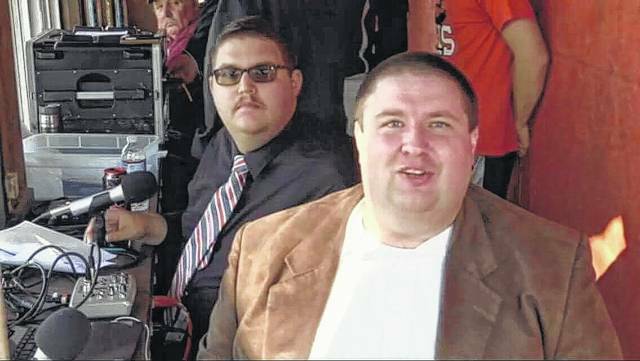 Nick Newton (left) and Tyler Rowland (right) became familar faces for the West Portsmouth Tanks this season in the broadcast booth. 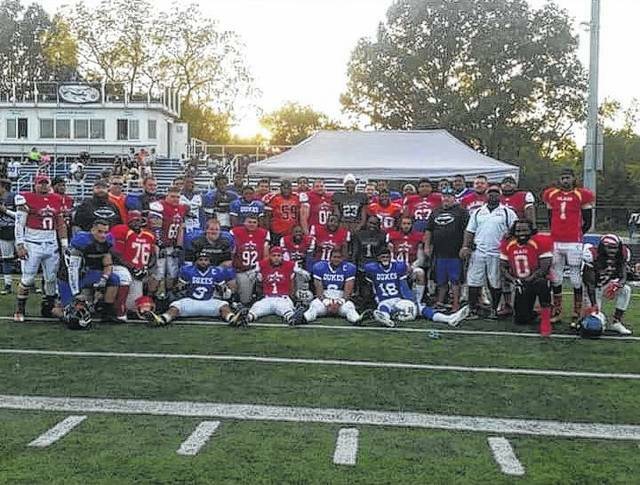 The Blue Collar Football League formed an all-star team to compete against the Battle Ground Football League’s all-star team on Saturday in Cincinnati. Several members of the West Portsmouth Tanks team played or participated in the game between the two leagues. Ultimately, the BCFL came out on top by a final score of 26-8. The Tanks had 12 players selected to play in the game, but only three players wound up competing. Defensive lineman Dominique Johnson, running back Antwan “AJ” Williams and kicker Zack Christensen represented West Portsmouth on the field. Head coach Jamie Rice roamed the sideline, coaching the BCFL defense alongside Rocky Johnson from the Dayton Oilers. Rice coached in place of Tanks defensive coordinator Brian Wroten, who was unable to attend the game. Not only were the Tanks able to send their coach and several players to the game, but the team also sent their broadcast crew of Tyler Rowland and Nick Newton. Rowland and Newton started a podcast at the start of the season, broadcasting games online for the Tanks. The two also produced video content for the team throughout the season, including a segment known as “Tank Talk” which featured interviews with various West Portsmouth players. Their broadcasts reached new heights when My Town TV broadcasted the BCFL Championship, as well as the all-star game on Saturday on television across the area. Not only are Rowland and Newton having fun, but their broadcasts have been received well. Rowland said that the Tanks had 8,400 views for the BCFL Championship, and reached 39,000 households in the area. The broadcasts, both online and on television, just go to show how rapidly the BCFL is continuing to grow. Both the BCFL Championship and the all-star game Saturday were successful for the league, and certainly captured a lot of attention.